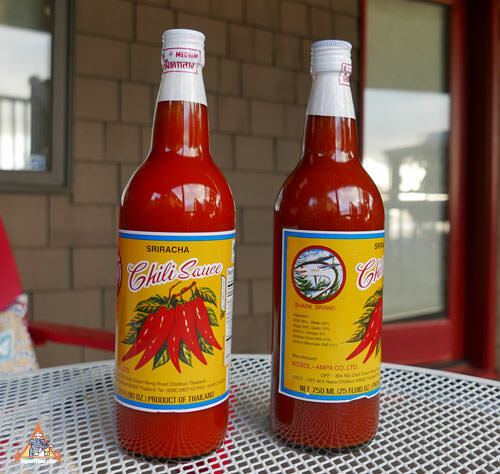 As featured on National Public Radio (NPR) January 2019 as the original Sriracha sauce from Sriracha Thailand, the only authentic choice for those that want the real thing. GQ Magazine declared our Shark Sriracha as a "Secret Weapon That Chefs Can't Live Without" (see below). Sriracha is a bold condiment sauce made of fresh red Thai chile peppers. Shark is our favorite sriracha sauce because it's an original classic that's been sold for years in Thailand. Not just a spicy dipping sauce, Sriracha is often an ingredient in Thai recipes. Shark brand is made in the Sriracha region of Thailand. It's the real thing--what the Thai people eat--and it's packed in a large glass bottle with the original classic label. Shark brand has a good mix of chile heat, and sugar/garlic/vinegar overtones to make it tangy and a bit sweet. Strong offers bold chile heat, somewhat like tabasco, but tangy and a bit sweet too. Medium flavor has the taste of Thai chiles but lower heat. If you buy both Strong and Medium, write it on the label because the only way to know the difference is the plastic seal on top, which gets removed when you open it. Use plenty--the large glass bottle is a generous amount. Ingredients: chile, water, sugar, garlic, salt, vinegar, xanthan gum, sodium benzoate. Spicy Thai Chicken Wings, "Peek Gai Nam Daeng"
Sun-Dried Beef, "Neua Dad Deo"
Thai Cashew Chicken, "Gai Pad Med Mamuang Himaphan"
Thai Sour Fish Soup, "Kaeng Som Phak Bung Phrik Sod Kab Pla"
Isan Style Sausages (Thai Hamburgers), "Sai Grog Tod"
"It's better than the Rooster sriracha everyone uses; it starts out sweet before seducing you with heat. Use it as your favorite hot sauce, which means pour it on everything." "My name is Chef Sam Bevelacqua. I'm a 50 year old retired executive chef of three hotels in New Orleans. I presently own the food & beverage operation at a local country club. I received my package from you guys some time back, but Sunday I opened the shark brand (med) heat and the new gold label fresh red chili sauce and it was all gone by Sunday night. OUT OF THIS WORLD STUFF. I'll never buy Huy Fong again, although I do like the intense chili flavor, but its a little to hot, sometimes over baring. Do you guys have a bulk bottle, or a gallon bottle available? I'm not using it at the country club, I'm using it at home, FOR NOW. The smell of these two chili sauces are intoxicating. I sprinkled some on the dog to make him smell good. Please respond, and thank you for your efforts. Your Satisfied Customer, Chef Sam Bevelacqua."